Pomegranate Passion Fruit Rum Fizz is the result of a dream I had in November. I dreamt I was making a cocktail and as soon as I woke up I wrote down what I made and made it later that weekend. 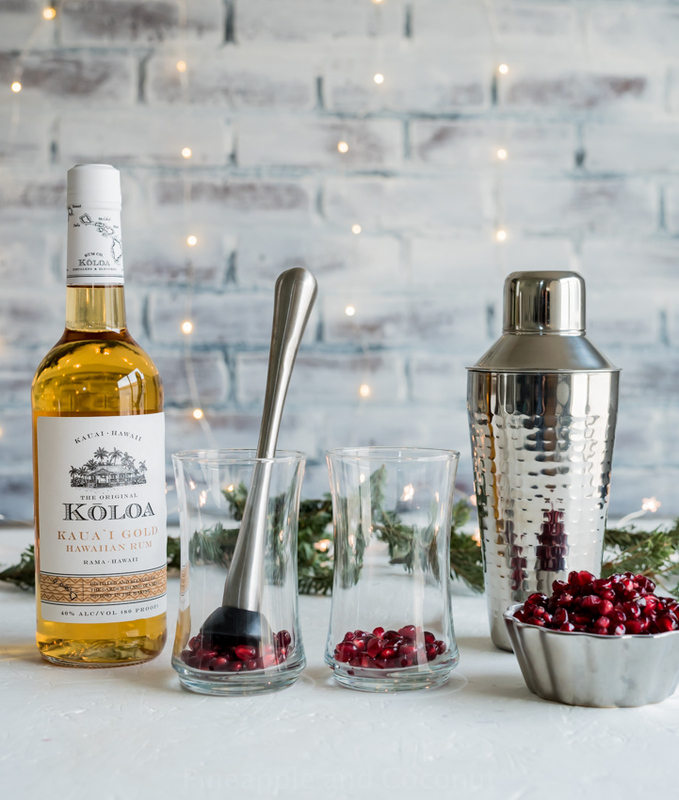 I have good cocktail making dreams because it is so tasty and I knew I had to make again for my #Drinkmas week with Koloa Rum Company. Koloa Rum Company sent me a few bottles of their rum for the cocktails I am making this week. In my dream I had made this with white rum and my first test of the recipe was with the white. I decided to try it with the gold rum and I am so glad I did. I like it better with the gold. Has a deeper flavor to it and balances out the sweet tart of the passionfruit and pomegranate. 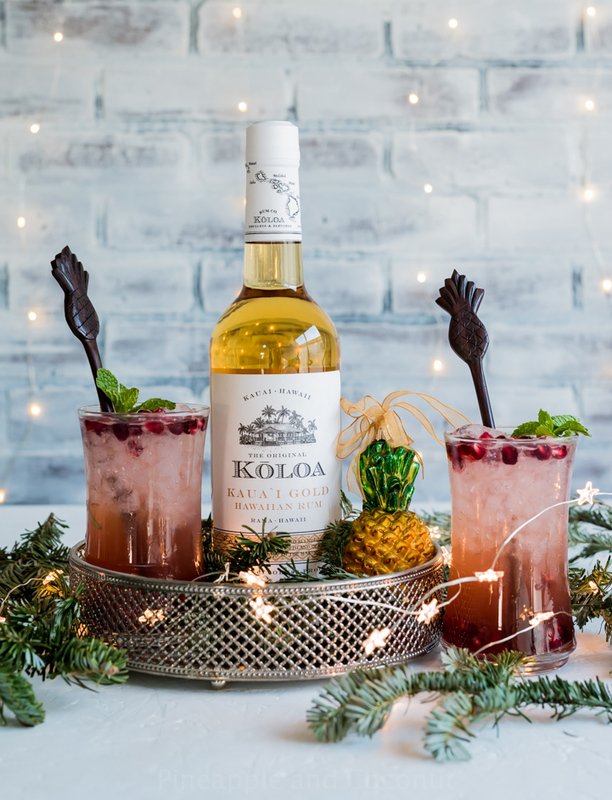 The Koloa Kaua’i Gold Rum is made from the mash of raw hawaiian cane sugar, instead of traditional molasses, and is distilled in a vintage 1210 gallon steam powered copper pot still with copper column and condenser . Koloa Rum had this still shipped over from Philadelphia, Pennsylvania. First by train, then by boat. It was quite the impressive journey to get the still on island. The still was built in 1947 by Liberty Smith Copper and it is 5/8″ thick copper. It is quite impressive considering how far it traveled to get to Kauai to distill this amazing rum. 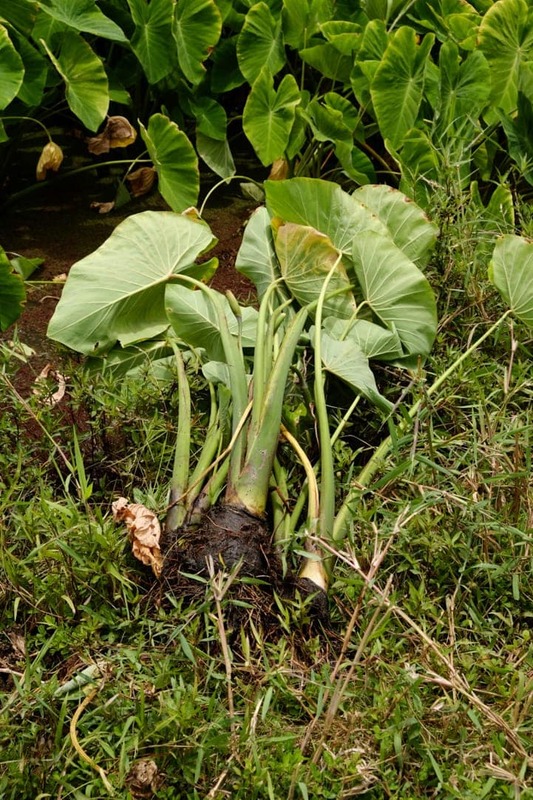 Koloa Rum is Hawaii’s first rum to be legally distilled on island. The rum takes 8-10 days to distill, they are all distilled two times, all the rums start out as white rum and have ingredients added such as caramelized sugar to lend to their color and differing flavors. All the rums have filtered water from Mt Waialeale. Mt. Waialeale is the wettest spot on the Hawaiian islands, the second wettest spot on earth, receiving an average of 450 inches of rain a year, and its name means ” rippling water”or “overflowing water” in Hawaiian. Koloa Rum was smart to set up their distillery at the base of this amazing mountain to take advantage of a never ending supply of water for their rums. The tasting notes on the Kaua’i Gold Rum are rich caramel with hints of butter toffee, amaretto and toasted macadamia nuts. 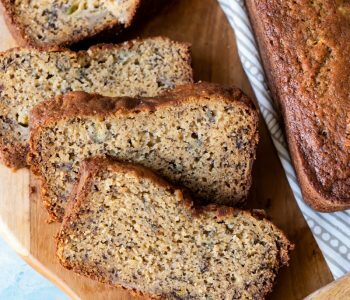 There is also a hint of vanilla and toasted almond. By itself it is an excellent sipping rum, and added into cocktails it make the cocktail that much better and richer tasting. 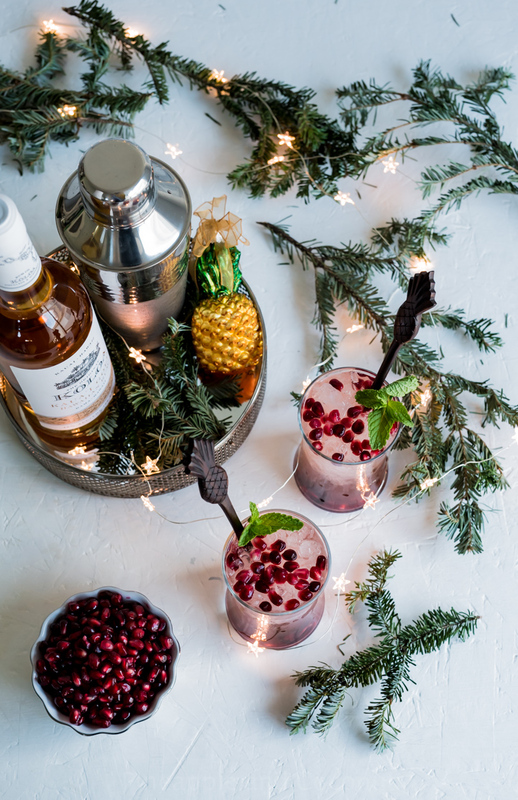 One would think to add gold rums to heavier mixers such as a hot buttered rum, hot toddy or other creamier cocktail. I really love it with fruit based cocktails since the tasting notes balance so well with the acidity and tartness of certain fruits and citrus. 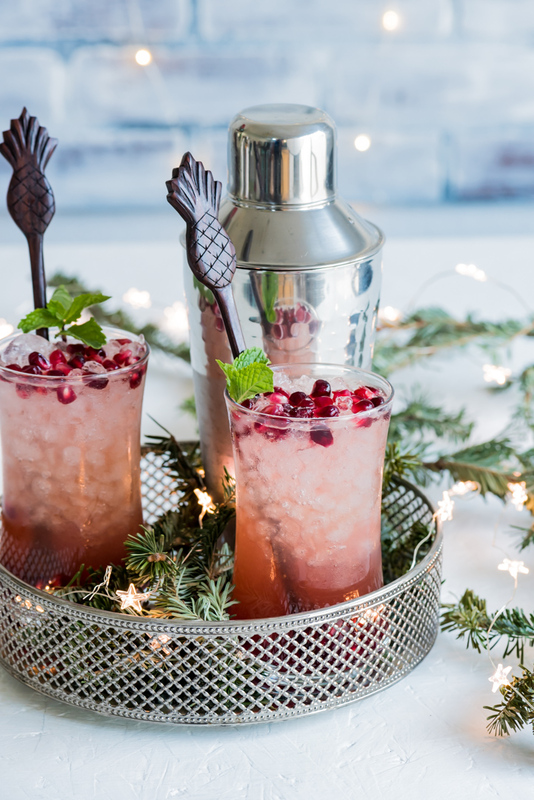 This pomegranate passion fruit rum fizz is a really well balanced cocktail. 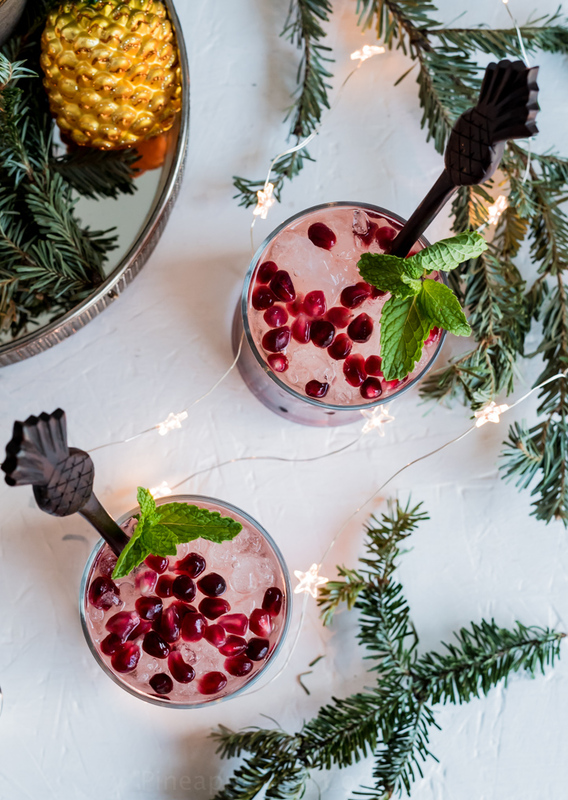 I know in my last cocktail recipe I made, the Christmas Coffee Rum Cocktail, I said I like to keep it simple when making drinks at home, and I think that this cocktail I am sharing today is pretty simple still. 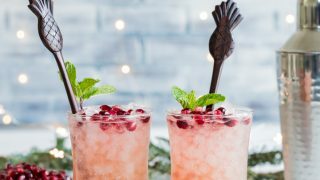 I started out with muddled pomegranate arils or seeds. 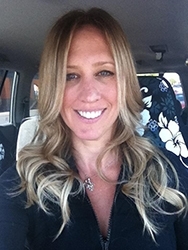 I am a fan of muddling or smashing certain ingredients in drinks to bring out more complex flavors into a cocktail. Plus it is fun to do. We planted a pomegranate tree in our yard two years ago because my daughters loved the dark red jeweled fruit as much as I do. Last year it yielded about a dozen or so smallish pomegranates. We read up on them and found they grow quite well in Las Vegas, some neighbors even have trees almost as tall as their houses with grapefruit sized pomegranates growing on them. This year we didn’t get as many, but the plant grew taller than our 6′ back wall. Hoping next year will yield more fruit. 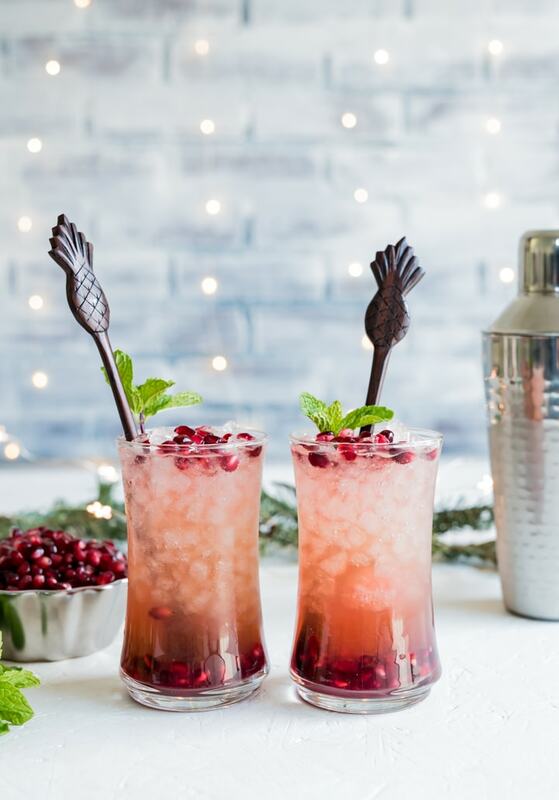 I bought the pomegranate arils for these pomegranate passion fruit rum fizz cocktails at Trader Joe’s. I love that they have them ready to go in packages. It eliminates the mess of breaking a pomegranate open. 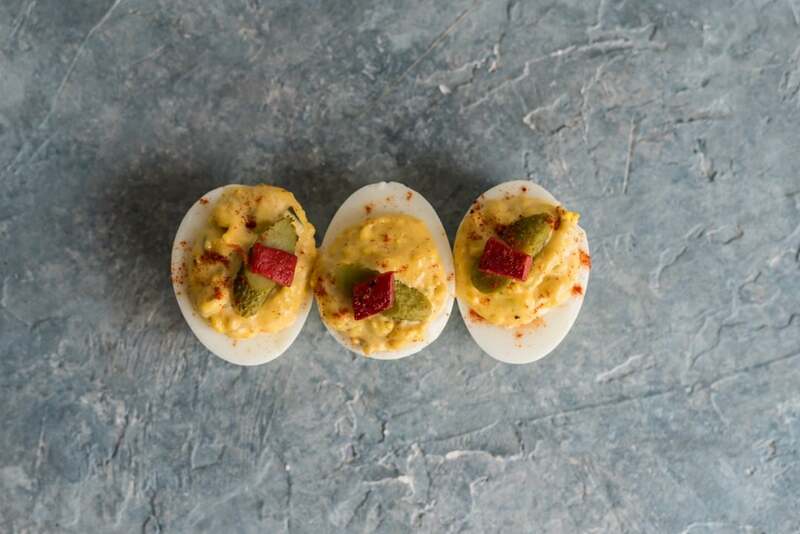 These packages offer instant pomegranate gratification. 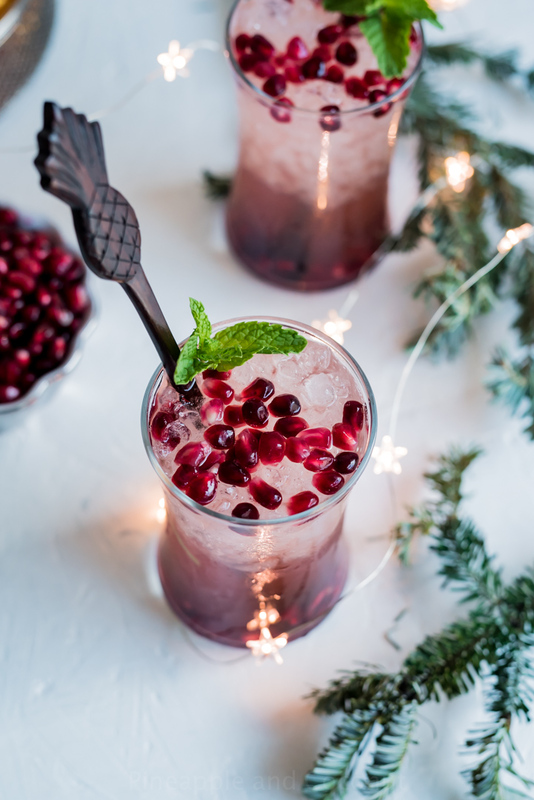 I also am a fan of making my own mixers and syrups for cocktails like my hibiscus simple syrup I made for my Christmas Mojitos last year. But for these I used my favorite Passion Fruit Syrup from my Aunty Lilikoi. Another local Kauai Product that I buy several of each of her products when I visit Kauai and have shipped home. My favorite is the passion fruit syrup and her passion fruit wasabi mustard. 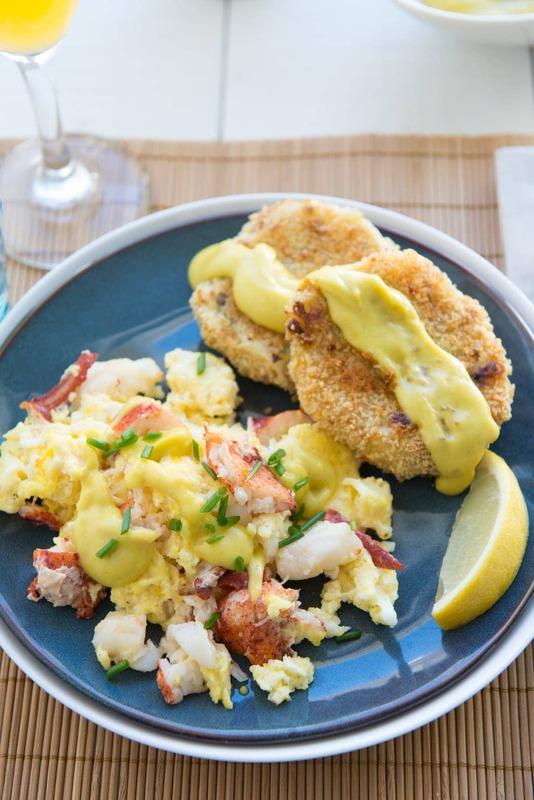 Ohhh so yummy. The passion fruit syrup has the tartness of the passion fruit that I love so much. I always say if Hawaii had a scent it would be a mix of plumeria and passion fruit. They both smell so amazing and always transport me back to Hawaii with every sniff. The syrup is great for pancakes and waffles but my favorite use is in cocktails. 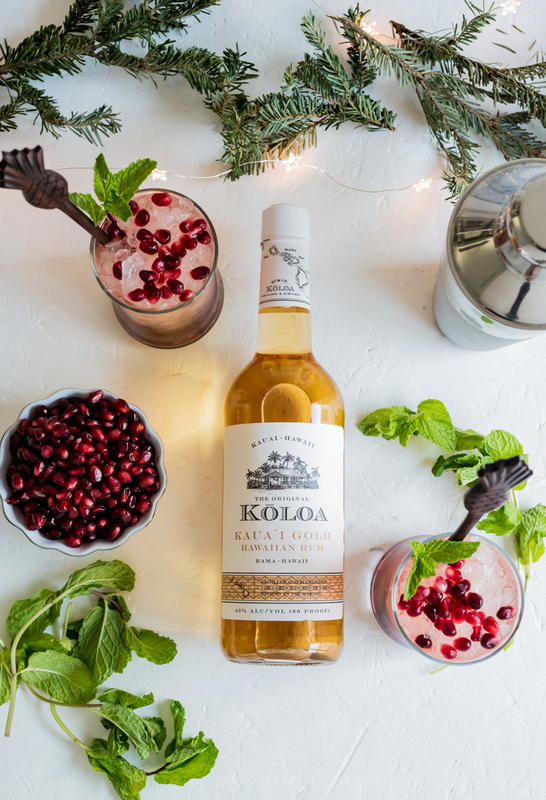 Another thing I love about the Koloa Rum Company is their usage of locally sourced products, that they fully promotes sound and sustainable agricultural practices and they believes that the eventual success of its products will provide meaningful support and diversity to the local agricultural industry. They also support local bars and bartenders with their ongoing Kauai’s best bartender contest at Rumfire located in the Sheraton at Poipu beach. 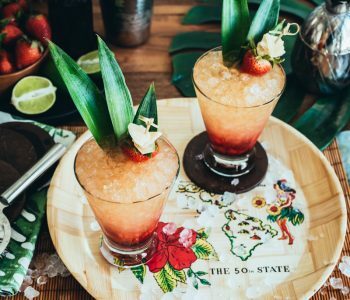 I ooh and ahh over the amazing cocktail creations the bartenders come up with at these events when I see them on Koloa Rum Company’s social media pages. The bartenders all get super creative with the rums and locally sourced ingredients such as herbs, aromatics, fruit etc. I would love to be a judge for all those contests! I bought these fun pineapple swizzle sticks/ cocktail stirrers at the Aloha Spice Company in Hanapepe, Kauai. It is right in front of the famous swinging bridge. Next time you are on Kauai head over there, talk a walk on the crazy bridge and stop into the Aloha Spice Company for amazing spices and neat trinkets like these pineapple sticks. Then head back to Kilohana for the Koloa Rum Company store and tasting room. In the tasting room you get to try all the rums and even try their Mai Tai shot. It is so delicious!! 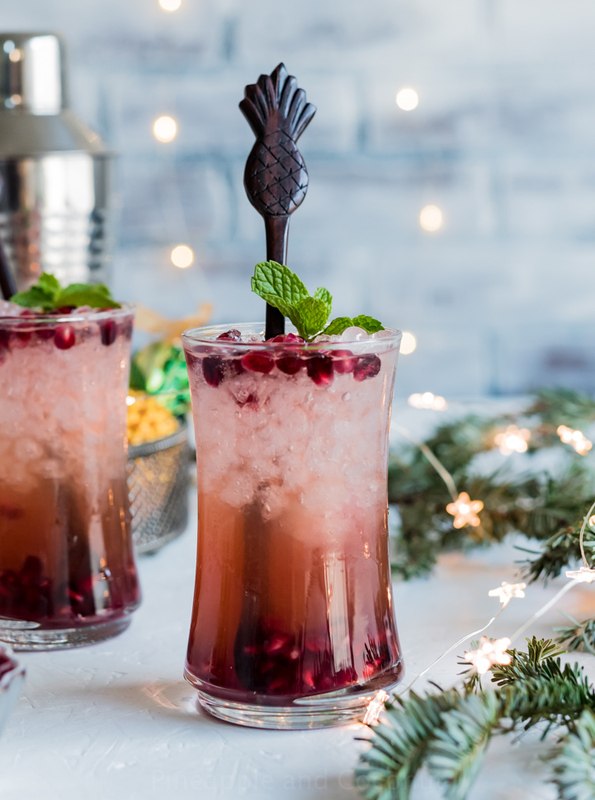 A gorgeous holiday cocktail with sweet and tart flavors from the passionfruit and pomegranate made fizzy with sparkling rosé. 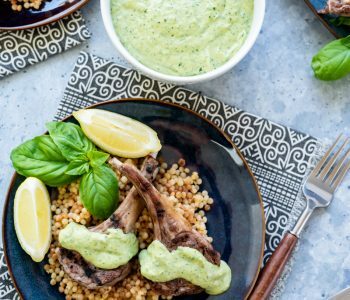 I added into the notes in this recipe how to make it non-alcoholic. This version is really tasty and refreshing. My kids love when I make them a “fancy” drink that looks like mine, but obviously without the alcohol. 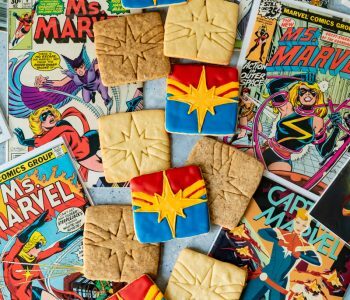 This would also make an excellent party punch as well. 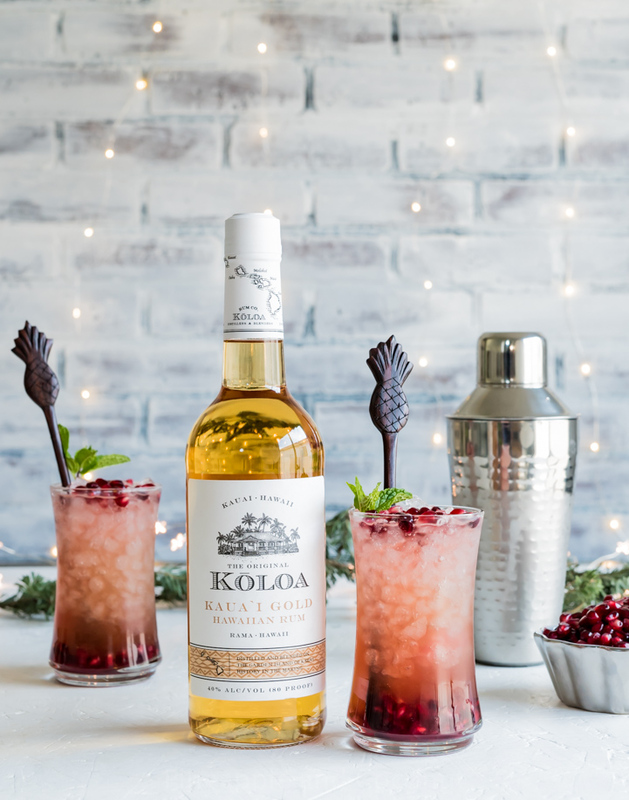 Thanks again to Koloa Rum Company for sending me a few bottles of their rum for me to create these pomegranate passion fruit rum fizz cocktails. 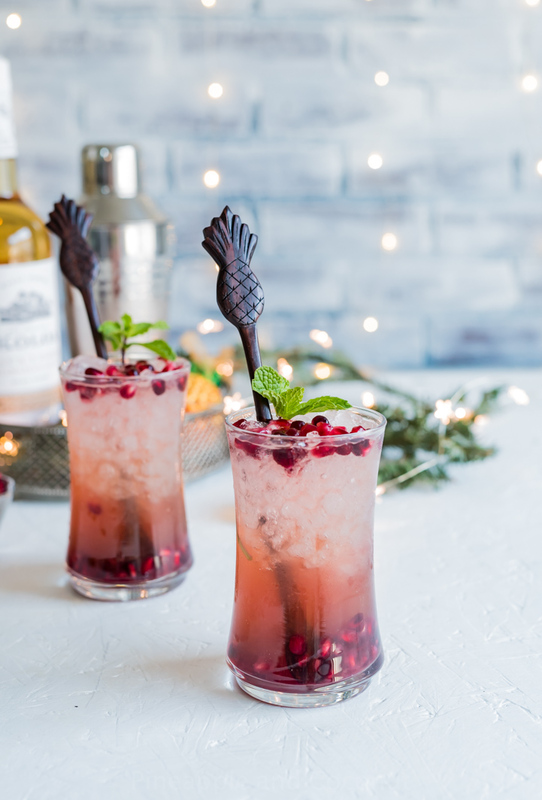 Like always all opinions are my own and I appreciate you all for supporting my blog and the brands I work with so I can continue to bring you all fun recipes like these cocktails!